Online storage, file sharing and data backup is all the rage these days. While perusing the latest tech news, you can’t go for long without reading all about the cloud, cloud, cloud! 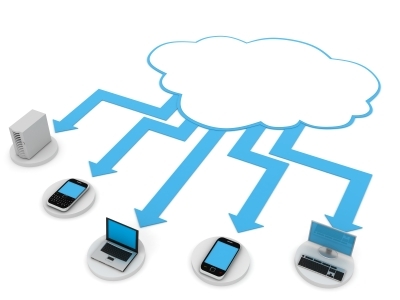 Cloud solutions! Cloud backup! Cloud storage! And while the term “cloud” might be the latest catch-phrase for storing data online, the concept has existed for quite a long time. One of my first encounters with this type of service occurred back in the early 2000’s, when I signed up for a free Xdrive account. This now defunct service was one of the initial pioneers in online data storage, offering consumers free online storage space to house their data. Xdrive provided software that integrated with Windows Explorer, allowing for a seamless user experience. The online storage simply showed up on the PC as an additional drive letter, the X drive. It was easy to use and worked relatively well. I use my personal mobile phone for receiving pages text messages from work, as I’m required to be available 24 x 7 in case of issues and I also work a rotational on-call schedule with the rest of my team. When you REALLY need a text message to get your attention, the stock “bling”, “beep” or “bloop” sound bytes used by most mobile phones just won’t cut it. Due to this, back in my Windows Mobile phone days, I would set the WakeupAlarm.WMA file as my text message audio notification when I was on-call. This is a really obnoxious and loud alarm clock sound byte, and that is sure to get your attention when a new text message arrives. When I moved over to Android, first with the T-mobile G1 and then with the Motorola Droid, I kept using this sound clip by copying the WakeupAlarm.WMA file over to my phone. And why not? It was a proven, effective, paging alert sound. Unfortunately, my Stand Operating Procedures (SOP) were thwarted once I upgraded to my Samsung Galaxy Nexus. Apparently Android 4.0 does not support WMA files, unlike previous versions of Android, which did so with no problems whatsoever. To continue using this sound file with Android 4.0, I had to convert it to a new format. 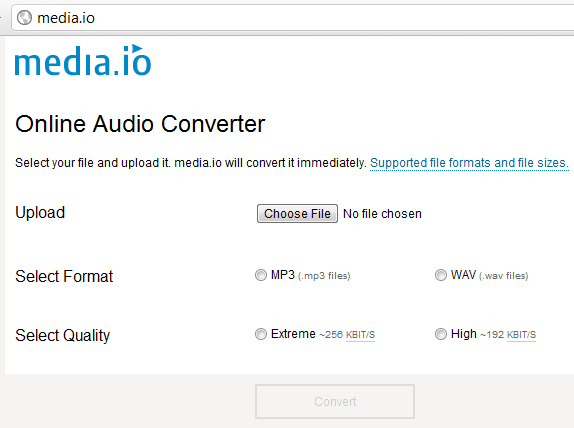 Media.io is an online audio file conversion service that allows anyone to convert virtually any audio file to an MP3, WAV, OGG or WMA audio file, all for free. As of this posting, the site also has zero advertisements and a very clean interface (see above for a partial image of the webpage). I was able to quickly and easily convert my WMA file to MP3 format thanks to Media.io. There were no artifacts, distortions or any other problems found in the resulting MP3 file and I am now once again happily using the WakeupAlarm sound byte on my Android 4.0 smartphone. I have tried using many other audio file conversion apps in the past, including some freeware found on CNet. None of the other apps that I tested were able to successfully convert a WMA file to MP3 with good quality. Many of the apps would do the conversion, but the resulting MP3 file would be static laden or contain other audio artifacts. Huge thanks and many kudos to Media.io creator Johann Burkard for creating such a useful, effective and totally free audio file conversion service. After my trusty ol’ Motorola Droid bit the dust, I selected Google’s flagship Android smartphone, the Samsung Galaxy Nexus, as my new mobile computing device. This phone comes loaded with the very latest Android OS version 4.0, also known by its code name “Ice Cream Sandwich” (ICS). In this post, I’ll explore some of the issues that I have encountered during my month and a half relationship with Android 4.0. But before I get into that, I’d like to preface the following segments by stating that I am very VERY pleased with the Galaxy Nexus and it is undoubtedly one of the best smartphones available on the market today. In that vein, I plan on featuring some of the more interesting (and positive) ICS features in future posts coming soon. In this post, however, I’ll be getting down to the nitty-gritty: problems & issues encountered in Android 4.0. You know what’s awesome? Google Voice Actions and Google Voice Search. Before Siri captivated iPhone 4 users, Google’s Voice Search & Voice Actions were available on the Android platform, allowing users to search, text, send emails, call phones and complete many other tasks using voice commands. 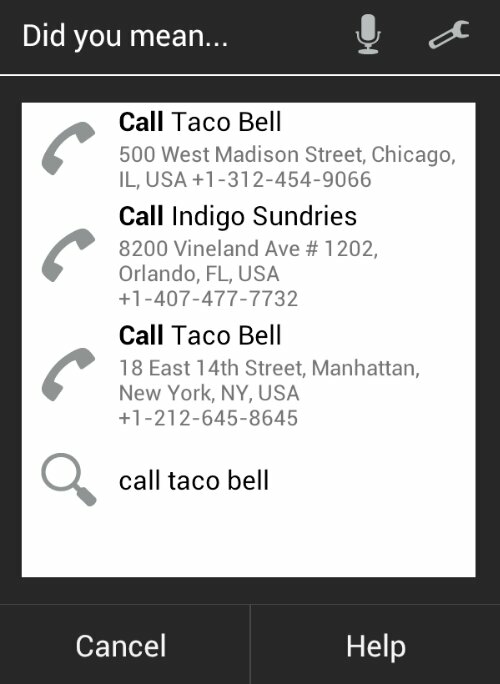 Unfortunately, when I migrated from my Motorola Droid running Android 2.2 to my Samsung Galaxy Nexus running Android 4.0.2, I was sorely disappointed to find that the Google Voice Actions “Call business-name” feature no longer provides location-specific/GPS tailored results. What should you do with an old smartphone? My recent post on the death of a smartphone got me thinking about what should be done with an old smartphone that no longer has voice service. Once you’ve upgraded to a fresh device, is your old phone useful for anything other than collecting dust? It most certainly is, and here are a few ideas of what you might do with that old device. One of the first and most obvious things that you can do is to list your smartphone for sale or use a website service that allows you to sell mobile devices. Depending on the age and popularity of your old device, there could be a lucrative market out there awaiting your gently used phone. iPhones in particular seem to have a strong second hand sales market and many other phones do as well. If your old phone still carries some worth, why not recoup some of the cash that you gave up on your initial purchase? Another idea is to repurpose that old smartphone. I’ve see many people reusing their old smartphones in a new way once they’re no longer used for traditional voice calls. There are many uses that you might consider. You can utilize the old rig as a dedicated media device for playing music, video and games, use it as a VoIP phone over WiFi with Skype or another app, use it as a portable storage device, use it as a remote control, use it for taking photos/video, or give it to a child to use as a toy. And let’s not forget, there’s always the option of donating that device to a friend or family member who could use an upgrade from their Motorola StarTac or a similar dinosaur. Accidents happen, and what happens if your new device meets an untimely end? If that were to occur, it’s nice to have a backup phone that can get you back in business right away, avoiding the pressure of having to purchase a brand new replacement immediately. Personally, I always try to keep at least one backup phone to use in case of emergencies and sometimes use a backup on “risky” trips (to avoid the loss or damage of my primary device). Worst case, if you can’t find another use for your old device, recycle it! Retail shops like Target and Best Buy have bins for recycling old phones, so drop them off there instead of tossing them in the trash. Do you have any other ideas for what to do with a smartphone after voice plan deactivation? If so, we’d like to hear your ideas in the comments below! The following is a guest post written by Bre Carter. If you are anything like me, you probably talk less on your smartphone than any other activity. Texting, searching Google, playing games, and posting to Facebook all consume much more time than actually using the device for its main purpose. Communicating with each other has kind of devolved into a text based system that places a steep value on literacy. Fortunately for those who do not want to read, you can also turn your smartphone into a cool remote control for your home theater. Most home theater systems require you to own several different remotes in order to control what you see and hear. This practice of remote control overload gets confusing really fast and keeps people from watching DVD’s or operating other cool features on their systems. By converting your smartphone into a remote control, you can do away with your useless remotes and enjoy the media that you want to. Instead of going out and purchasing a brand new remote with a specialized interface, most people are deciding to download free apps and products that convert their smartphones into remotes. While still costing up to $100, using a smartphone is a much cheaper option than the existing smart products on the market. In order to use an app installed on an iPhone, you must purchase additional equipment from a retailer. Most televisions rely on an infrared system to communicate information with remote controls. According to PC World, you need to use products like NewKinetix for iPhone, or AV/Shadow for Android and Blackberry devices. One of the most useful ways to control your television through your smartphone is the DVR. Companies like Direct TV, DISH, and AT&T U-Verse all have mobile websites that allow you to program your television. If you want to watch Jerry Springer, but have to work during the day, you can program the show from your office and have it waiting for you when you get back. While the market for smartphone remote apps may be weak right now, once people start purchasing more smart televisions the need will start to increase. In order to get more brand recognition with consumers, brands like Samsung and Google will want to immerse their image in the minds of all of those watching with free apps. If you are still only using your smartphone to make calls, or look up unknown numbers through Anywho.com, you are missing out on a wide world of diverse entertainment. 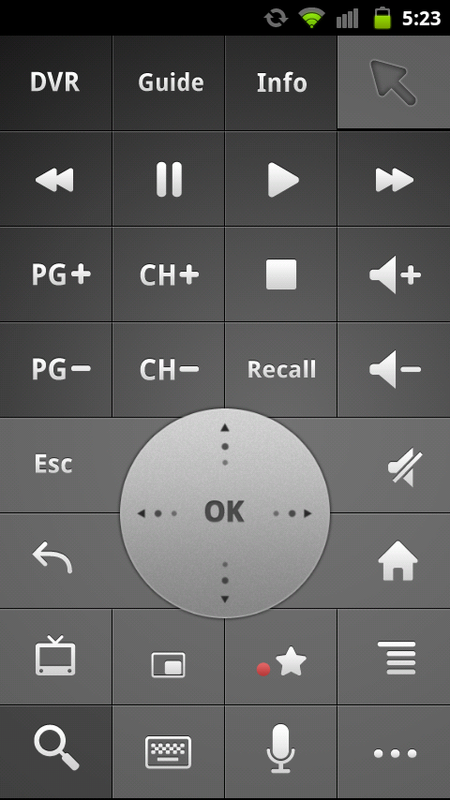 Try exploring the App Store or the Android Market in order to find remote control options that fit your needs. 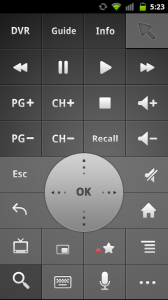 Editor’s Note: In our household, we use many Android remote control apps to manipulate our WiFi connected devices, including Google TV remote, Roku Wi-Fi Remote and GMote (used to control a laptop connected to a TV via HDMI). All of these apps connect to the device you’re controlling via Wi-Fi, so no additional equipment is necessary. About this Guest Author: Bre Carter is a journalism student at Saint Louis University. Upon graduation, she hopes to travel the world while producing compelling content for the masses. When she isn’t writing, you can find Bre with her nose in a book, or her headphones in to block out the rest of the world.